If you told a sheep grower back in November you’d give them 530¢ for lambs in May, they would have considered it. If you told them you’d give them that for mutton, they’d have laughed at you. But here we are, with the Victorian Mutton Indicator at 530¢/kg cwt. Figure 1 shows how sheep and lamb slaughter jumped in the week ending the 5th of May, as processors returned to full weeks. In terms of total sheep and lamb slaughter, it was actually the biggest week since the second week of March. Obviously the strong slaughter was helped by heavy supply in saleyards, and subsequent lower prices. Yardings were again strong this week, but were down around 20% on last week. 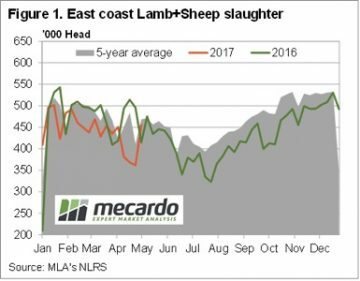 The lower yardings saw the Eastern States Trade Lamb Indicator (ESTLI) rally marginally this week, closing Thursday at 641¢/kg cwt. Mutton yardings were also strong relative to last year, but down on last week. 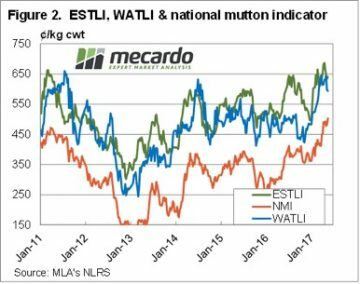 The National Mutton Indicator (NMI) reacted by gaining 22¢ to hit a new record of 503¢/kg cwt. This is the first time the NMI has broken 500¢ (figure 2). Can you believe Mutton in Victoria is averaging 530¢/kg cwt. Mutton made up to 588¢/kg cwt in the saleyards. No doubt the good autumn break, good lamb prices, and good wool prices have combined to see growers hold sheep. 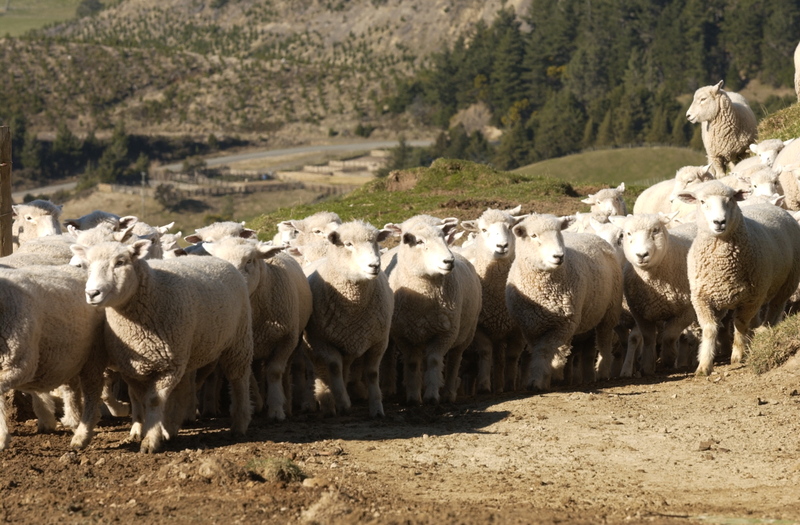 Demand for sheep from restockers is also strong. 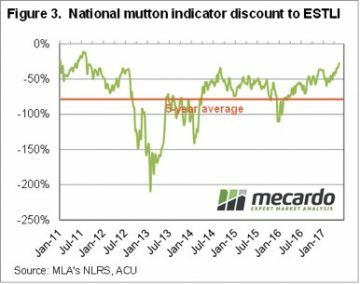 Mutton still hasn’t reached a record relative to lamb prices, figure 3 shows it sits at a 27.5% discount. Back in 2011, when lamb prices were falling, mutton was at just a 14% discount. It seems unlikely lamb or sheep supply is going to improve in the short term, with the tap to turn on sometime in August. What happens from there depends on the season, but we can expect to see price decline fairly rapidly once lambs start to hit the market.